Whether you like your pie sweet or savory, deep-dish or portable, there’s a plate out there with your name on it. For those days when one pie is not nearly enough, try Three Brothers' legendary Pumpecapple Piecake, also known as the turducken of pies: a 24-pound, three-tiered cake consisting of pumpkin pie inside a pumpkin spice cake, pecan pie in chocolate cake, and apple pie in apple spice cake, smothered in cream cheese frosting. Hey. This is Texas. Go big or go home. Cooking may be an art, but baking is a science, and Susan Fergason knows it. The former biologist and science teacher now brings her curiosity and precision to mouth-watering pies like bourbon peach, fireball apple, and lemon sour cream. The bakery has also established itself as a community hub, offering baking classes, hosting music events, and supporting science education. It’s hard to improve upon perfection (pie-fection?) but the folks at Magpie may just have done it. The bakery’s menu offers its famous not-too-sweet pie in multiple formats, including pie fries, pie shakes, and, of course, regular pie, in seasonal flavors like butterscotch bourbon or Mexican hot chocolate. And not only does Magpie satisfy all your dessert needs, they have dine-in savories like beef stew pot pie or a mac and cheese pot pie. Are you vegan and sick of missing all the pie fun? Head over to Mission Pie in San Francisco, which boasts a rotating menu featuring the best in seasonal ingredients and delightful vegan options, such as vegan pear raspberry and vegan apple blackberry. You wouldn’t think a deep-fried pie could ever be light, but baker Nancy Fulton of Arbuckle Mountain Fried Pies has managed it. Each pie takes only three minutes to make and can be filled with your choice of sweet and savory flavors like pizza, sausage and egg, cherry, and the customer favorite: apricot. You can even call ahead with an order so your pies will be hot and waiting when you arrive. Want a slice of apple, pumpkin, or blueberry pie? Go somewhere else. Michigan’s legendary Cherry Hut will sell you any kind of pie product you like—as long as you like cherry. Its signature dish has been featured in The New York Times and Gourmet magazine. Can’t make it into the shop? Check out the online store for jams, dried cherries, and more. Take your pie experience to the next level at Four and Twenty Blackbirds. Bakers and sisters Melissa and Emily Elsen opened their Brooklyn bakery in 2010. By 2011, Time Out New York had named them Artisans of the Year for their sophisticated gourmet pies and treats. Flavors like strawberry balsamic and chamomile buttermilk keep dedicated customers coming back for just one more taste. 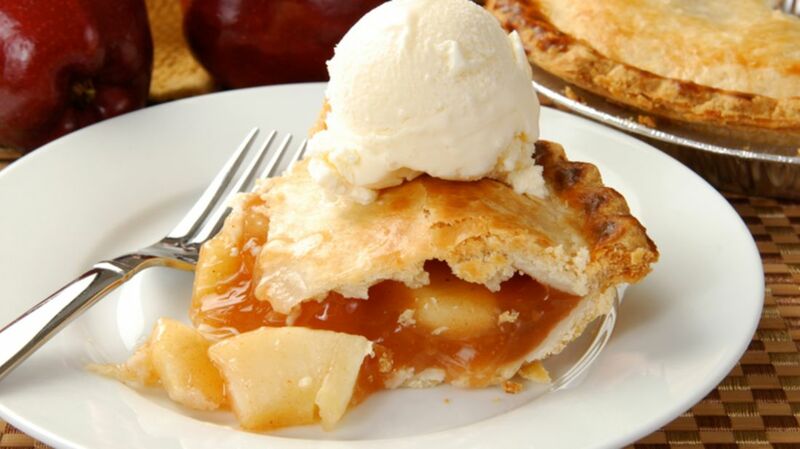 It’s official: The best apple pie in America is made in Mukwonago, Wisconsin. Gourmet magazine, the Food Network, and The Wall Street Journal have all raved about the Elegant Farmer’s sweet, gooey pies. The house specialty is an apple pie baked in a paper bag, which, the proprietors say, keeps the sugar cookie crust both firm and crisp. Even chefs line up at Chicago’s Hoosier Mama for a taste of piemaker Paula Haney’s artisanal creations. Beat the Illinois winter blues with a slice of Haney’s key lime pie with a crunchy gingersnap crust, or one of her various chess pies. Dangerous is the key word here. This famous Baltimore pie shop now offers local delivery, including of its signature Baltimore Bomb, made from layers of regional chocolate Berger cookies and vanilla custard. And for a rock 'n' roll-themed bite, try the peanut butter, bacon, bananas, and chocolate-covered Elvis pie. You can’t get much fresher pie than at the Achatz Handmade Pie Company, which installed itself in a 10-acre orchard for access to the ripest, freshest fruits. Try the Michigan four-berry pie with raspberries, blueberries, blackberries, and cherries—only one of which is technically a berry (the blueberry), but when it tastes this good, we’ll let it slide.